Salad can be fun! Salad can be exciting! Salad can be satisfying!  Who am I kidding? We’re all adults here. Let’s admit it. When it comes to salad, it’s alllllllll about the dressing (also, croutons). 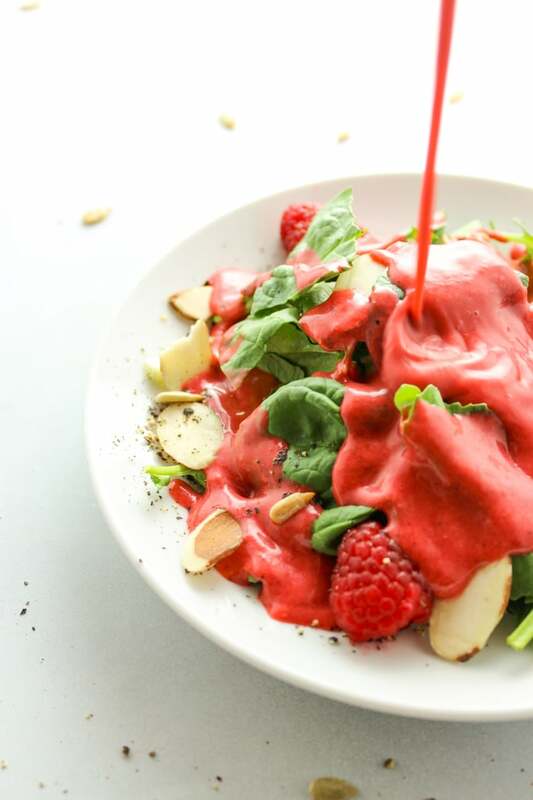 And this dressing is something special because it’s made with raspberries! Which means we get bonus points for eating this salad because the dressing sneaks in a serving of fruit. If you’re gonna eat a salad, you might as well do it right. I got your back, fam. If it was up to me, summer would last forever. But fall is coming quick out here in the West. It’s barely going to hit 55º here today and there’s already snow on Pike’s Peak! (Winter is coming… for all of you Game of Thrones fans out there. ) I’m not sure how I feel about this. New state. New city. New climate. New home. New seasons. My birthday is this weekend and it needs to be warm. It has to be warm. I need a couple more weeks of summer, please. I figure while there’s still a little bit of life left in summer, I figure I might as well eat some freakin’ salad. Everybody does salad a little different. 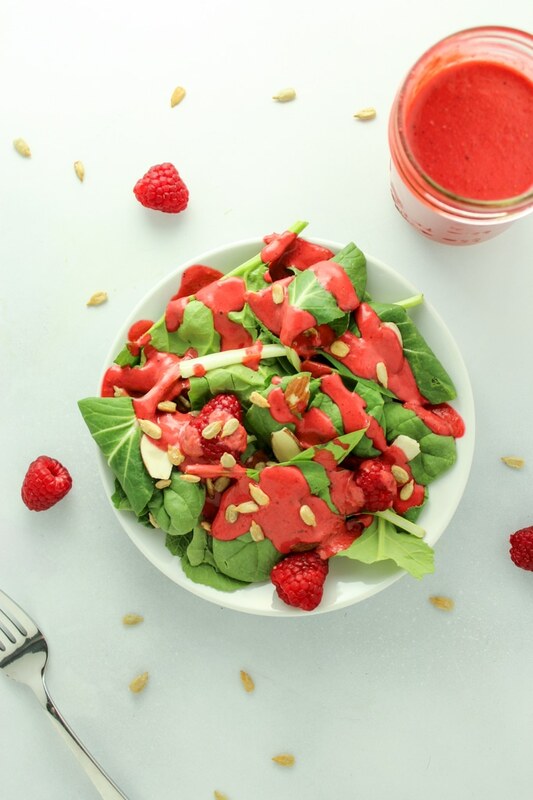 My go-to formula is as follows: crunchy mixed greens (bonus points if there’s some spicy arugula or mustard greens involved), tomatoes, salty sunflower seeds, red onion (a MUST) and a simple dressing like this one. I like to prepare a big jar of this stuff and keep it on hand for whenever (the rare) salad craving strikes me. I usually have everything I need on hand to make a good dressing and I know what I like. No one needs to run to the grocery store just to buy a jar of dressing. You guys are totally capable of making this dressing at home. 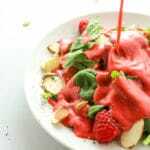 And I conveniently have a couple other DIY dressing recipes on the blog. 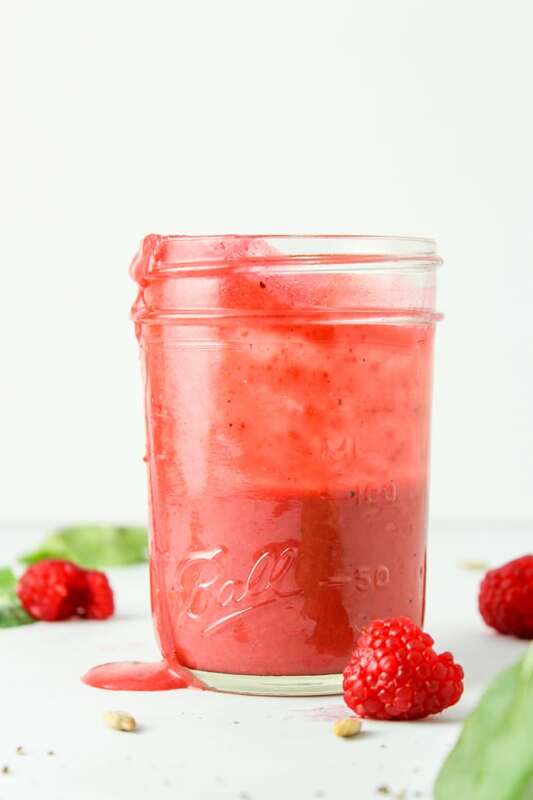 If you aren’t into raspberries or if you feel like mixing it up a bit, this one-jar lemon option is the bomb and I’m a pretty big fan of this orange-based variation during citrus season. We made a quick video for this particular combo to show you how easy it is!